Regis Dean of Athletics Pam Roecker knows what it’s like to be a student-athlete. She was a point guard for the women’s basketball team at the University of Wisconsin at Green Bay and was the school’s first female to earn Academic All-American honors. In 1995, she was inducted into the university’s Hall of Fame. She went on to become an assistant basketball coach at the University of Wisconsin-Green Bay, the University of Massachusetts, and later at Seton Hall University. In 1990, Roecker was named head coach of the women’s basketball team at Wagner College in New York City. In 1998, she was appointed head coach for Loyola University in Chicago. For the last 15 years, Roecker has served as a television broadcaster for college basketball games on major networks including ESPN3, Comcast SportsNet, and NESN. During that time, she also served as director of athletics and recreation at Emmanuel College, then Gann Academy in Waltham. 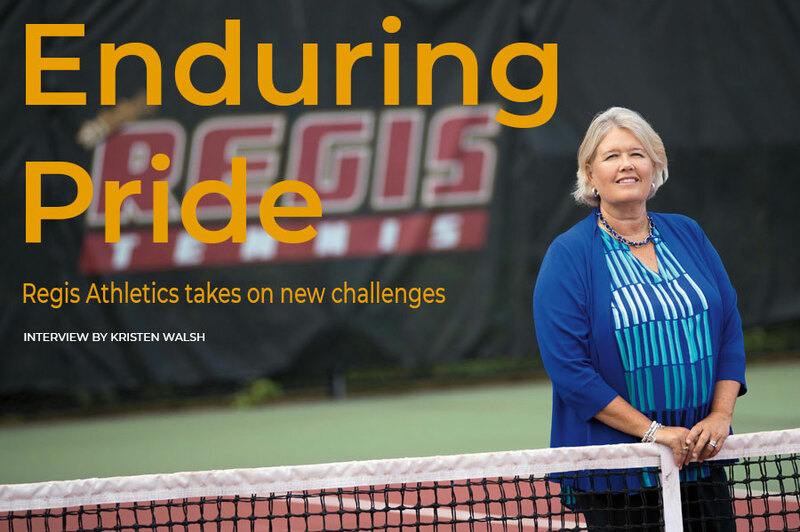 Here, Roecker talks about her passion for sports and her vision for the Regis Pride. What is your goal for student-athletes at Regis? I have many goals for our student-athletes. The first is broad-based: to recognize that competing for the Pride creates a learning environment that perfectly complements their classroom education. Student-athletes are challenged to lead, to handle adversity, to be resilient, to win with grace, and to lose with dignity. Their competitiveness in sports can translate to a desire for high achievement academically. Personally, I hope they will make friends and memories for life, including coaches who will serve as positive role models and mentors. The final goal is for student-athletes to achieve individual and team goals while representing Regis in a sportsmanlike manner. All of these skills are going to prepare them for the rest of their lives and their careers. Regis entered the Great Northeast Athletic Conference (GNAC) this fall. What does this mean for the university and the Regis Pride? Joining GNAC gives us a chance to continue our local and regional prominence, and really has the potential to put Regis on the map at a national level. Specifically, it’s going to increase opportunities for championship competition. There are more automatic bids, meaning that teams winning the conference will have an automatic opportunity to compete in the NCAA (National Collegiate Athletic Association) tournament. Students and coaches can challenge themselves at an even higher level against some of the best programs in New England. My philosophy is to communicate clearly and confidently regarding vision and expectations, to establish fair and equitable standards, to be hands-on, visible, and accessible, and perhaps most importantly, to exhibit a genuine passion, enthusiasm, and belief in what we are doing on a daily basis. What was your favorite part of coaching? I loved the competition. The strategy and challenge of finding a way to win—especially winning in an underdog situation—was extremely exciting. I enjoyed seeing student-athletes achieve goals and success beyond what they thought possible and also develop as young women and players over their four-year career. My relationships with assistant coaches were incredibly special as well, and I value their friendships to this day. Why are you passionate about sports broadcasting? One of my favorite things about this aspect of my career is that chance to tell the story of the players and coaches. In-game analysis is certainly critical too, but I pride myself on doing in-depth research on each team so that tuning in will be a very enjoyable experience for the viewers. I’ve also developed an interest in training the next generation of student broadcasters. When did you first develop a love for basketball? I developed a serious interest in basketball in middle school. In the 1970s, my home state of Wisconsin did not have the organized AAU (Amateur Athletic Union) play that is common today. But my exposure to the sport at the local YMCA was the start of a lifetime love of the game. Sports have been—and continue to be—a huge part of your personal life and career. What keeps you interested? The uncertainty of outcome was and is the thing I enjoy most about sports. You practice, prepare, and show up on game day not knowing how you or your teammates are going to perform. Facing individual physical and mental challenges, momentum changes, improbable comebacks, officials, and game crowds tests your mental toughness and allows you to fully immerse yourself in the moment. What is your advice for student-athletes? Be the best that you can be, whatever that is—in the classroom, on the playing surface (court, track, field), and in life. This means handling yourself in a respectful manner at all times and using competition in a productive way. Academically, give your authentic best effort in every class. Athletically, be a coachable, dedicated, resilient, positive, and sportsmanlike team member. Personally, always remember you are representing yourself, your family, and—during these four years at Regis—our program and this university. Be proud of yourself, appreciate this opportunity, and incorporate this mantra throughout your life and career after graduation.